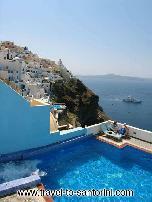 Clinging to the edge of the cliff, Hotel Loukas offers the visitors a traditional Santorini setting. 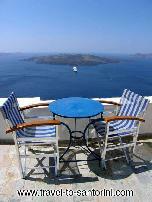 All 25 rooms have spectacular views of the Aegean sea and of the famous Santorini Volcano. A well designed swimming pool and Jacuzzi sits with it's back against the mountain. Bright pink bougainvillea festoons against stark white washed walls. 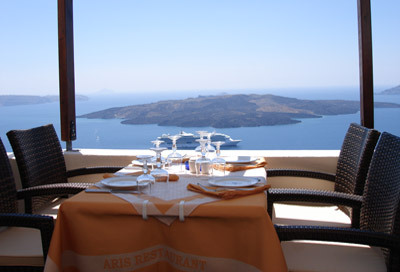 The Restaurant "Aris" caters to all tastes with an extensive menu of Greek and International cuisine and a wonderful selection of fine local wines. Breakfast and pre/after dinner drinks are served in the Cafe-Bar "Renaissance" perfectly situated to watch the sun go down. 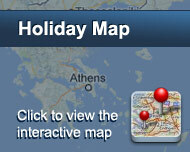 All rooms are air-conditioned with bathroom, satellite TV, telephone, fridge, hair dryer and safety deposit boxes. 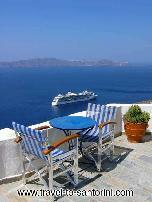 Relaxing on the terraces at Hotel "Loukas" enjoying the 180° ocean view, eating freshly cooked food can only be a wonderful experience to remember. Είστε ιδιοκτήτης ή διευθυντής στο LOUCAS; Εγγραφείτε τώρα για δωρεάν εργαλεία, που μπορείτε να χρησιμοποιήσετε για να βελτιώσετε την καταχώρησή σας και να συνδέσετε την ιστοσελίδα σας και το σύστημα κρατήσεών σας.